[Tokyo, Japan, December 7, 2017] Huawei, the world’s leading information and communications technology (ICT) solutions provider, and NTT DOCOMO, INC., Japan’s largest mobile communications carrier, marked a milestone in their joint 5G trials by succeeding in high-speed data transmission over a distance of 1.2km on the 28GHz millimeter wave (mmWave) spectrum. The field trial, which took place at Tokyo Skytree in downtown Tokyo, was conducted in an environment where a base station working over 28GHz was located at Tokyo Skytree’s viewing deck at a height of 340m above the ground, while user equipment was placed on the roof of a shopping facility at Asakusa Station. Under adverse conditions of a -10dBm penetration loss which came from the window glass of the viewing deck, the partners achieved more than a 4.52Gbps downlink throughput and a 1.55Gbps uplink throughput with a coverage range of 1.2km. 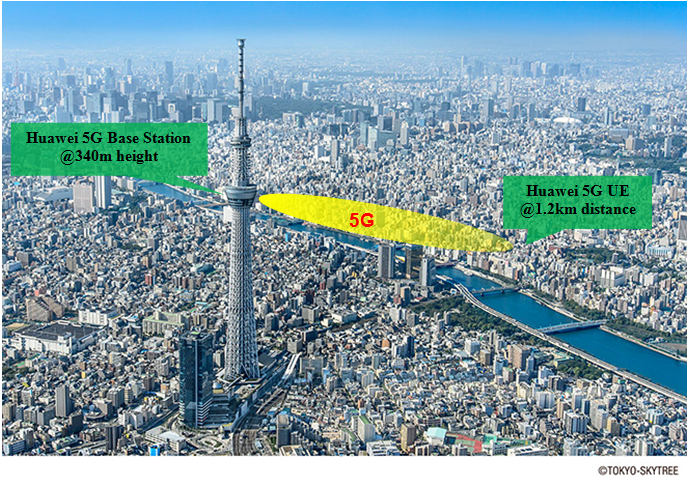 Huawei and NTT DOCOMO conducted a high-speed and long distance 5G mmWave field trial on the 28GHz millimeter wave (mmWave) spectrum at Tokyo Skytree (the 5G base station location) and Asakusa Station (where user equipment was placed). Huawei’s 5G base station which supports Massive MIMO and beamforming technologies, is involved in these trials to support successful long distance data transmission over the 28GHz mmWave. In addition, the 5G core network and 5G mmWave test user equipment (TUE) has been provided by Huawei to enable an end-to-end 5G network. Visitors to this open field trial experienced next generation video communication using a Microsoft HoloLens over the end-to-end 5G network. An immersive experience was created during the live demonstration, with clear voice calls and smooth video footage free of freezing being displayed.